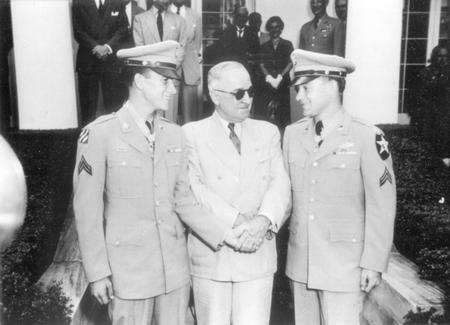 Difference between revisions of "Harry S. Truman"
| caption = Reproduction of photograph depicting Ron Rosser with President Harry Truman and another soldier at the ceremony where Truman presented Rosser with the Congressional Medal of Honor, ca. 1952-1953. Rosser was a corporal with the Heavy Mortar Unit, 38th Infantry Regiment, 2nd Infantry Division, United States Army. During service in the Korean War he received the Congressional Medal of Honor for his single handed attack on enemy bunkers. | caption = Reproduction of photograph depicting Ron Rosser with President Harry Truman and another soldier at the ceremony where Truman presented Rosser with the Congressional Medal of Honor, 1952. Rosser was a corporal with the Heavy Mortar Unit, 38th Infantry Regiment, 2nd Infantry Division, United States Army. During service in the Korean War he received the Congressional Medal of Honor for his single handed attack on enemy bunkers.